Mentally Impaired (MI) Drive April 13,14,15. Please sign up to volunteer for a few hours and collect donations and hand out Tootsie Rolls at various local businesses. By subscribing, I understand that I will recieve the monthly Monaghan News via email. 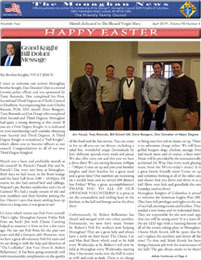 George F. Monaghan Council | Knights of Columbus © 2019. All Rights Reserved.